The ultimate feel-good gift, flowers make spirits bloom. So the next time a friend is feeling low, let them know you're thinking of them with a beautiful bouquet of get well flowers, it's just what the doctor ordered. Express your best wishes for a speedy recovery, in most cases, same-day flower delivery is available and that's good news – because when it comes to getting them back on their feet, the sooner the better. 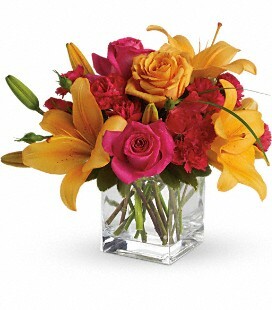 It's bursting with bold, beautiful jewel-toned flowers that are sure to cheer up their little corner of the world. Nobody likes to be sick in bed, and we could all use a cheerful boost to help take our minds off it when we are. It's a breath of fresh air for someone stuck indoors and a colorful companion when you can’t be there. 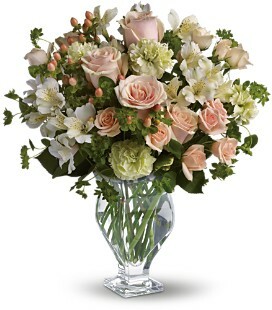 Bursts with classically beautiful flowers such as pink roses, white alstroemeria and crème carnations has a peaceful Victorian charm. 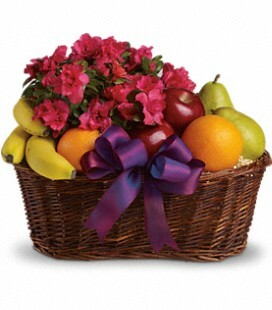 Why not send them our bountiful Fruits and Blooms Gift Basket? The fruit is arranged alongside a gorgeous flowering plant, which is a lovely treat to be enjoyed long after the goodies are gone. Any third-grader can tell you that an apple a day keeps the doctor away. And we all know the health benefits of Vitamin C. So when a friend is under the weather, send this delicious assortment of fresh produce including apples, bananas, oranges and pears, it arrives tucked inside an oval wicker basket. And if they're likely to receive a steady stream of visitors, this gift makes it easy to be the gracious host without even getting out of bed.